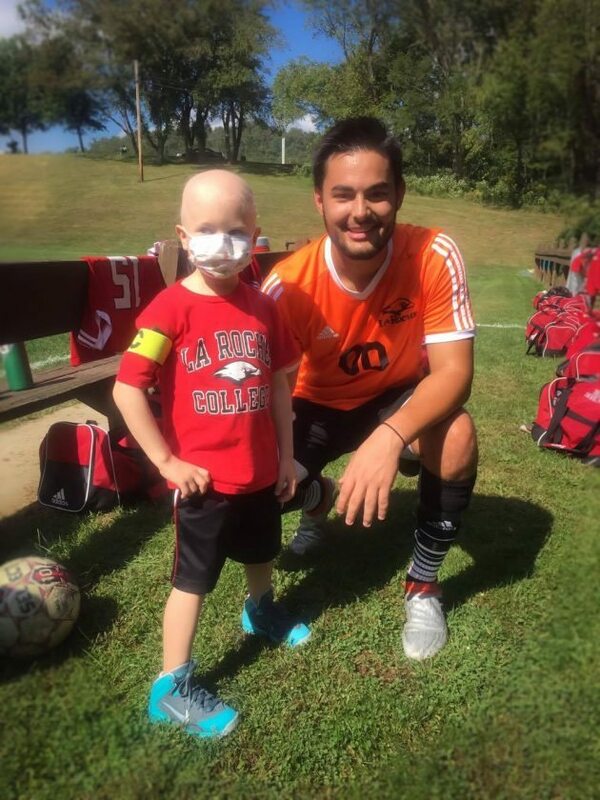 Photo Provided MARTINS FERRY kindergartner Leo Zambori poses with La Roche College soccer player Conner Hagins prior to a match last week at Bethany College. Zambori served as an honorary captain for the match because of a relationship he formed with Hagins during a hospital stay in Pittsburgh. Zambori is currently battling leukemia. If you ask a lot of young kids who their favorite college sports team is you might hear things like Ohio State, West Virginia, Notre Dame, etc. Leo Zambori, however, may have a slightly different answer. The Martins Ferry youngster, who is battling leukemia, might tell you La Roche College. Yes, the Division III school in Pittsburgh has definitely caught Zambori’s attention. But, maybe not as much as he’s caught the school’s attention. During a match last week at Bethany, La Roche’s men’s soccer team recognized Zambori, who is a 5-year old kindergartner at Martins Ferry, as an honorary captain against the Bison. And it came as a total surprise to Zambori and his family. According to Natalie, her son met La Roche goal keeper Conner Hagins through a ‘Cuddles for Kids’ program when Leo was first admitted to Children’s Hospital last spring. Hagins actually founded the program, which is still ongoing at Children’s, when he was a young boy. Leo was excited when he found out that Hagins played soccer, but his excitement went off the chart when he learned Hagins was a goalie because that’s the position he had played during his indoor soccer season last winter. During a recent trip to Pittsburgh for treatment, Conner told Leo and his family of a game they had coming up at Bethany. Because of low count numbers, Natalie didn’t know if it would be a good idea to attend. She reached out to Bethany College about specifics pertaining to its field’s location. After hearing it was somewhat secluded, Natalie decided to take Leo. As soon as the La Roche players — with Hagins leading the way — came on the field, they noticed Leo was in attendance. Hagins came over to Leo and presented him with the captain’s arm band for the game. La Roche cleared it with the officials and Bethany that Leo could take part in warmups. On top of that, they wore special gold shirts in honor of Leo. The gold was because September is Childhood Cancer Awareness Month. He also stood with the team during the National Anthem and flipped the coin. Leo’s day drew national attention when NCAA Soccer tweeted out a picture of him flipping the coin. Though La Roche fell to the Bison, 3-1, Leo and the Zamboris didn’t care. They took more away from the game than any win or loss. La Roche has invited the Zambori family to its game against Penn State-Behrend on Oct 22, which it plans on attending as long as all is well with Leo. The efforts of Hagins and La Roche soccer are just another on the list that the Zambori Family wishes to express its gratitude toward. Zambori’s battle with leukemia is marching on. He begins his next phase of treatment on Tuesday at Children’s Hospital. Natalie spoke at the Belmont County Commissioners meeting last Wednesday. For the Zambori’s, it’s all about raising awareness. As he continues his fight, Zambori is on a home-bound instruction program through the Martins Ferry City Schools. The school district has also worked well with Natalie, who is a member of the faculty, in allowing her time off to be with Leo and for his appointments.